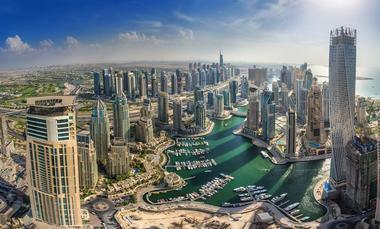 Dubai is a global business and entertainment hub that attracts expatriates and visitors from all over the world. It is considered one of the best places to live in the Middle East and is filled with family-friendly attractions that are cultural, fun, and interesting for every member of the family no matter their age. Whether it’s going to the highest outdoor observation deck in the world’s tallest building or eating delicious food, Dubai has so many things to offer its visitors. Visitors can enjoy gaining a better understanding of the old way of life in Dubai in the immersive experience offered at the Al Fahidi Historic Neighborhood. Travelers of all ages can be taken back in time as they walk through the pathways and alleys that wind through the stunning architecture. Many of the buildings were constructed in unique styles using stone, sandalwood, gypsum, teak, fronds, and palm wood. Throughout the year, this historic neighborhood hosts many cultural activities featuring characters dressed in traditional attire. 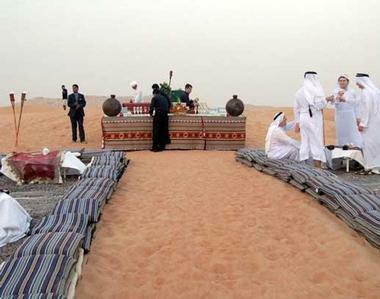 Visitors can purchase souvenirs and dine on the delicious treats and meals for which the United Arab Emirates is known. 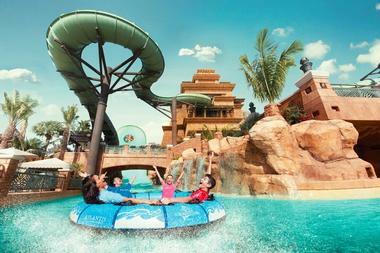 Located inside Atlantis the Palm Hotel, the Aquaventure Waterpark is a thrilling way to cool down on a hot day. There is something for everyone no matter their age, as toddlers have a designated area filled with kiddie pools, mini-slides, and other fun activities, while the rest of the family can enjoy record-breaking water slides and thrilling rides. Aquaventure is more than just a waterpark as it is home to sharks, stingrays, and a number of other marine life, all of which visitors have the opportunity to interact with in a safe environment. The waterpark also gives visitors access to a private beach for more fun-in-the-sun activities such as beach volleyball or jet skiing. 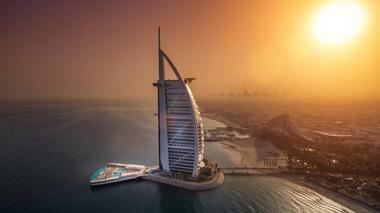 One of the most iconic structures in Dubai, the Burj Al Arab is a self-proclaimed seven-star luxury hotel that resembles a sailboat and sits on a man-made island connected to the mainland by a bridge. Sadly, those who are not hotel guests are not permitted to visit and explore this lavish hotel with its impressive lobby of gold pillars and dancing fountains, but they can reserve a table for high tea or a meal in one of the nine restaurants and bars, allowing them to explore when they for their meal. Some unique features and amenities for hotel guests include floor-to-ceiling windows with amazing views, 24-carat gold iPads to order room service, designer toiletries, and a spa and fitness center. 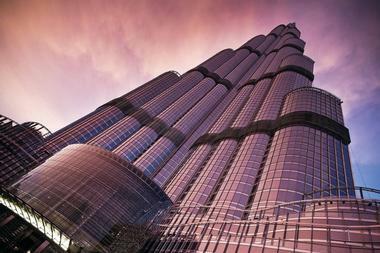 The tallest structure in the world, the Burj Khalifa is a must-visit attraction when in Dubai. Other than being the tallest skyscraper on the planet, this iconic landmark structure breaks many other world records, including the world’s fastest elevator and the world’s highest outdoor observation deck. This skyscraper offers stunning views, and visitors can head to the top for breathtaking panoramic 360-degree views of the city, the Dubai Fountain, and the Arabian Gulf. This experience, which is separated into two observation decks, ‘At the Top Burj Khalifa’ and ‘At the Top Sky’, includes a visual journey of how Dubai has transformed over the years as well as an open-air terrace for an exciting view downwards, among other activities. 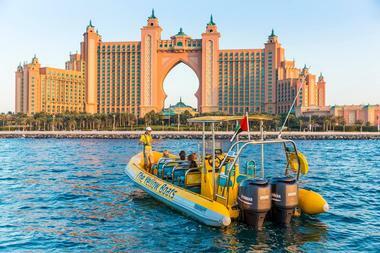 Dolphin Bay, home to six of the friendliest residents of the Atlantis the Palm Hotel, was voted ‘One of the Best Animal Encounters in the World’ in 2015 by AttractionTix. Rightly so, as visitors can partake in one of the most sophisticated dolphin experiences in the world, which is also suitable for the entire family. 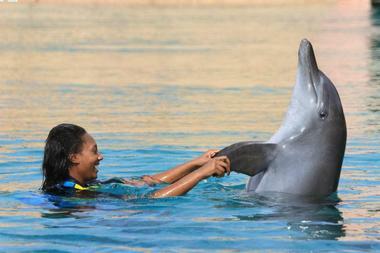 Visitors can swim, play, feed, and take pictures with the dolphins under the supervision of experienced trainers. SCUBA diving with the dolphins is a favorite option as it allows visitors to get up close and personal with these amazing creatures. 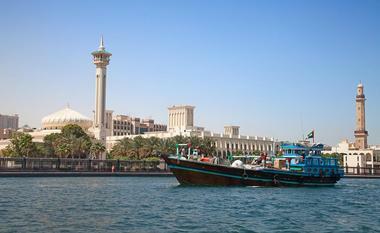 Dubai Creek, also known as Khor Dubai, is a saltwater creek that divides Deira and Bur Dubai. 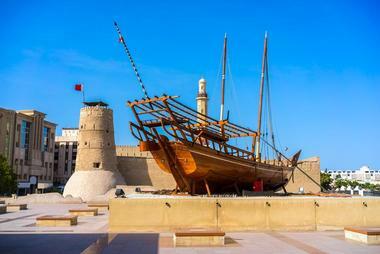 It used to serve as a port for dhow sailing vessels carrying goods from India or East Africa in the early 20th century. 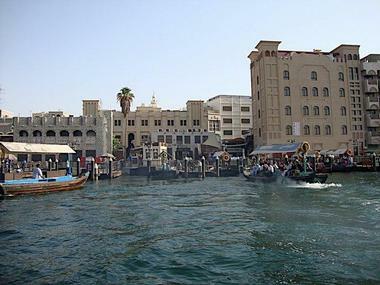 Now, visitors can take a dhow dinner cruise down the creek and enjoy some breathtaking views of the architecture that surrounds it, such as the Deira Twin Towers, Sheraton Dubai Creek, National Bank, Dubai Creek Tower, and the Chamber of Commerce. It is also home to the Dubai Creek Golf & Yacht Club, which is a stunning 18-hole tournament golf course. The Yellow Boats is a guided sightseeing tour that was established in 2009. Since then, the award-winning company has been leading visitors on a water-based sightseeing experience that is incomparable. Visitors can choose from four tour options, the most popular being the 90-minute tour that shows visitors a little bit of everything, including the Palm Jumeirah, Burj Al Arab, and Dubai Marina, ensuring that visitors get stunning photo opportunities at each location. 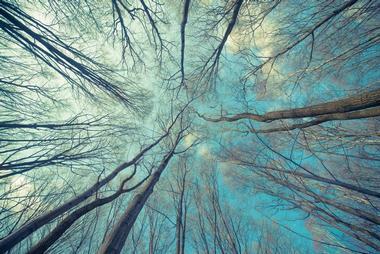 The tours are run by experienced guides who are informative and make sure that each experience is a unique one. 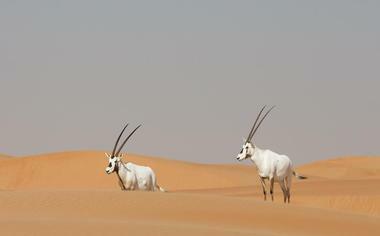 The United Arab Emirate’s first national park, the Dubai Desert Conservation Reserve, is one of the largest areas in the country dedicated to preserving the last bit of unspoiled desert and the priceless natural heritage found there. Visitors can view the many species of flora and fauna that can be found in this habitat while better understanding the measures that are being taken to protect endangered species and conserve their natural surroundings. Some of these include hedgehogs and antelopes, spiders and scorpions, and a range of plants that are indigenous to the area. The world’s largest dancing fountain, the Dubai Fountains, offers an amazing display of waterworks accompanied by lights and music to create a beautiful, dramatic show for visitors to enjoy. Equally stunning from the grounds of the Dubai Mall or from the observation deck of the nearby towering Burj Khalifa, visitors will love the fountain show. Set on the Burj Khalifa Lake, the water dances to the rhythm of the music played in the background and lights reflect the water that shoots up into the air. Visitors can view the show at various times between 1:00 pm and 11:00 pm daily. 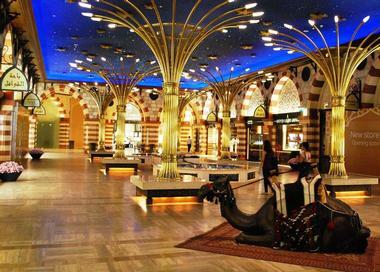 Visitors can spend literally days and days exploring the Dubai Mall as it is the largest shopping mall in the world. It attracts over 34 million visitors a year, and rightly so as there are over 635 retailers, including almost every major fashion brand in the world. Whether visitors are looking for some high-class retail products from Armani, Burberry, Dior, Fendi, Chanel, Dolce & Gabbana, Moschino, or Jimmy Choo, they’ll be sure to find it here. There are also tons of family-friendly activities within the mall, such as the Dubai Ice Rink, SEGA Republic, and the Dubai Aquarium, which has over 33,000 animals within its walls. The Dubai Marina is a 2-mile man-made canal city comprising apartments, towers, and several other official and residential high-rise skyscrapers. Visitors will find an array of charming cafes and restaurants along the Dubai Marina waterfront with stunning views of the boats docked on the lake. The family will enjoy spending a day on ‘The Walk’, which has over 300 restaurants, department stores, boutiques, cafes, and activity and fitness centers. The Dubai Marina is also home to Jumeirah Beach, where visitors can indulge in adventurous water sports such as jet skiing or speed boating. The only Sikh temple in the United Arab Emirates, the Guru Nanak Darbar Sikh Temple has been open to Sikh devotees and visitors of all religions since 2012. Travelers who are not visiting the temple for the religious aspect will love exploring it anyway. The distinctive architectural structure sits on 25,400 square feet of land and is the location of a number of exciting community events that are filled with culture, color, and delicious foods. The stunning beauty of the temple and the 54 meter parikrama within it attract thousands of visitors every year. 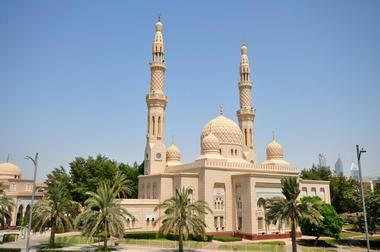 The Jumeirah Mosque is a wonderful attraction where visitors can learn more about Emirati culture. There’s a tour hosted every day of the week, except Friday, at 10 in the morning, taking visitors through this stunning architectural landmark. This tour shares educational facts about Dubai’s history and culture and gives visitors the opportunity to try dates, Arabian coffee, and a range of traditional pastries such as baklava and basbousa. The architecture of the mosque is popular among tourists and the mosque is often called ‘the most photographed mosque in all of Dubai’. 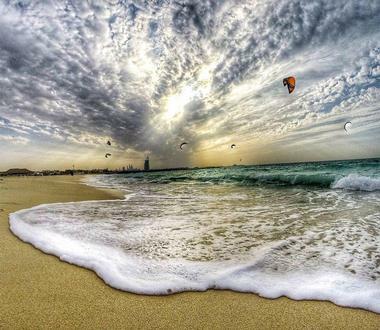 Kite Beach, also known as Kite Surfers Beach or Sheikh Hamdan Beach, is famed for, you guessed it, kitesurfing. It is considered one of the sportiest beaches in Dubai because of the plethora of different activities that it offers, and visitors can participate in volleyball, soccer, jogging on the track, stand-up paddleboarding, kayaking, and of course flying kites, among other activities. The beach is perfect for families with children as there’s a state park nearby fitted with an outdoor trampoline area and a dedicated children’s area. After a fun-filled day spent on the beach, visitors can dine in one of the many beach-style restaurants nearby, including Salt, which is famed for their burger sliders. A wonderful combination of traditional Middle Eastern shopping featuring stands and barrows as well as modern luxury brands and boutique shops, Souk Madinat Jumeirah is a great place to visit when in Dubai. Visitors will find a range of things, such as jewelry, fashion, accessories, and souvenirs, that make the perfect gift for loved ones back home. After a day of shopping for wondrous goodies, visitors can indulge in dining experiences that take them all over the world. 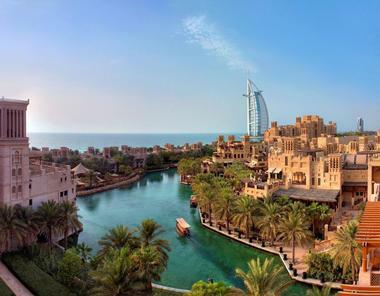 Madinat Jumeirah is home to over 20 restaurants that range from Italian, Asian, and Indian cuisine to the more traditional Arabian, Lebanese, or Persian culinary concoctions. They say that all that glitters is not gold, but that is definitely not the case at Dubai’s famed Meena Bazaar. This outdoor shopping pavilion houses hundreds of shops, many of them dedicated to gold jewelry, diamonds, and other precious gems. Visitors will love walking through the brightly lit streets filled with shimmering gold jewelry, mostly 24 carats, in a variety of designs and styles, such as bangles, necklaces, chains, rings, and unique traditional pieces. Even more exciting is the fact that the bazaar is open until midnight most of the week. There are plenty of restaurants and cafes in which to relax and refresh after exploring. Whether visitors want to tour Dubai by location or by activity or plan to visit some amazing cultural attractions, OceanAir Travels has something for everyone. There are over 50 different tours to choose from, and each has a range of activities, including shopping, flyboarding, cooking, or skydiving. 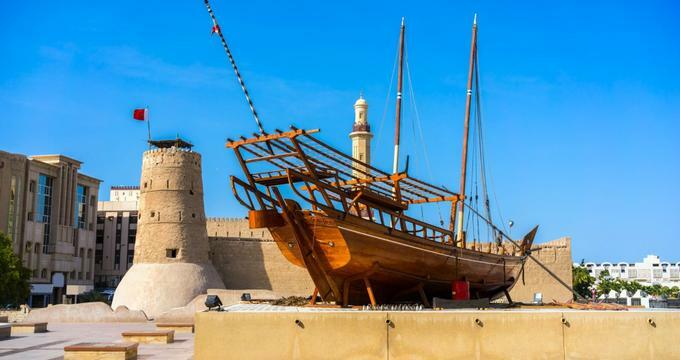 Some of the most popular tours include the Dubai Heritage Dinner Safari, which takes people through Dubai’s breathtaking desert, and the Full Day Atlantis Waterpark tour, where visitors can spend 8 hours cruising down some of the best water slides in the world. There are tours that branch out of Dubai as well, such as the Full Day Ferrari World, which takes visitors from Dubai to Abu Dhabi’s amazing amusement park, or the Khasab Musandam Cruise to Oman. More popularly known as the ‘Palm Islands’ due to its shape, the Palm Jumeirah is an artificial archipelago that is an iconic landmark structure known throughout the world. 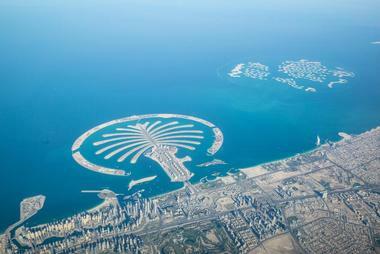 One of three man-made islands constructed by the United Arab Emirates, Palm Jumeirah is the smallest yet still one of the most stunning. The fronds of the palm tree are home to residences, offices, and hotels, including five-star hotels such as Kempinski Palm Jumeirah Hotel, Fairmont The Palm, Rixos The Palm Dubai, and Atlantis The Palm. Visitors can explore the land area through the Palm Jumeirah Monorail, visit the amazing ‘underwater’ hotel, and even go SCUBA diving in the breakwater between the fronds as it is home to thousands of marine species. Dubai’s most popular park, Safa Park, lies on the famed Sheikh Zayed Road, but it is a calm and peaceful getaway compared to the hustle and bustle of the city that surrounds it. Locals and visitors head to the 158-acre urban park to spend the day relaxing with a picnic, enjoying a boat ride on one of the three lakes, or going for a stroll or jog around the walking track. There are hidden passages and gardens that give the park a sense of intrigue, and the park is popular with people coming to read, draw, paint, or meditate. Every Friday visitors can enjoy the Organic Friday Food Market, which is filled with goodies from local food suppliers and artisans. With the motto ‘Open Doors. Open Minds.’, the Sheikh Mohammed Centre for Cultural Understanding is a non-profit organization that aims to remove cultural barriers between people based on their religion or traditions. 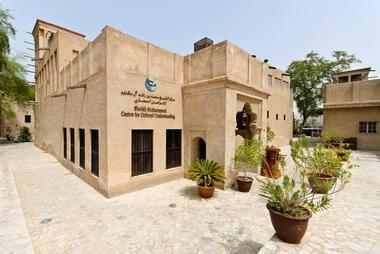 The friendly center is a place for visitors to better understand the customs and culture of the Emirati while promoting awareness to visitors, expatriates, and even residents. The experience is a fun one as visitors can try out several traditional foods, sit in on an educational lecture or Arabic class, attend cultural events, dine for iftar during the holy month of Ramadan, or go on a tour of Dubai’s heritage sites and landmarks. An exotic land such as Dubai has numerous attractions and places of interest; some are popular with tourists while others are gems hidden within this magical land. 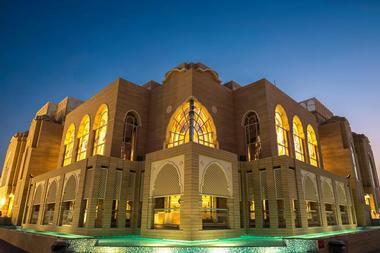 What better way to make the most of your vacation than going with Arabian Adventures? 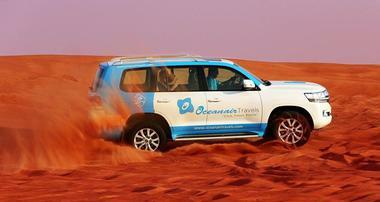 This tour company combines personalized service with Arabian hospitality, giving guests an adventure of a lifetime. The experienced tour guides go beyond Dubai so that visitors can also see the rest of the United Arab Emirates in exciting packages such as the Traditional Dubai City Tour, a Bateaux Dubai Dinner Cruise, or an Abu Dhabi City Tour that includes passes to the one-of-a-kind Ferrari World. Spending your vacation on Dubai’s seemingly endless expanse of desert may seem strange, but it will be one of the most memorable events of the entire vacation. Starting with a ride on the sand dunes in an off-road 4X4, visitors arrive at a camp in the middle of the desert filled with fun things to do such as camel rides, sandboarding, and belly dancing. There are many opportunities to take pictures in the stunning sunset, get up close and personal with a falcon, apply henna body art, or try on traditional attire. All safari trips include a delicious Arabian barbecue and can be conducted in the morning, in the evening, for dinner only, or even overnight. 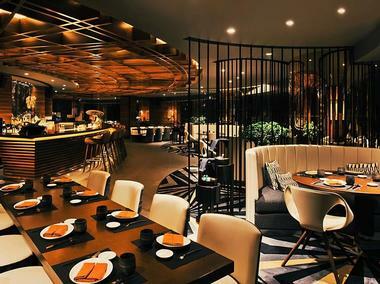 Located at Le Royal Meridien Beach Resort and Spa in Dubai, Zengo is a unique restaurant overlooking the meticulously landscaped gardens and the Arabian Gulf. Meaning “give and take” in Japanese, Zengo presents pan-Asian flavors in everything from its stylish, elegant decor to its carefully designed and balanced dishes meant for sharing. The restaurant, lounge, and terrace are spacious, opulent, and very comfortable, the decor is warm and understated, inviting lingering over the pieces of art that emerge from the kitchen. The menu is large and includes sushi, ceviche, dim sum, tempura, and robatayaki. On the ancient Japanese Robata grill, the chef prepares food on open counters to the delight of expecting guests. Zengo has three themed bars offering classic as well as innovative and imaginative cocktails. The Terrace Bar overlooks the Arabian Gulf and offers high quality drinks accompanied by music chosen by the restaurant’s in-house DJ. Ravi isn’t known for fine dining, a romantic meal, or even the best traditional cuisine. Instead, the restaurant is famed for having extremely delicious, and affordable, Pakistani food. Many have claimed that the food is better than dining in Pakistan itself. 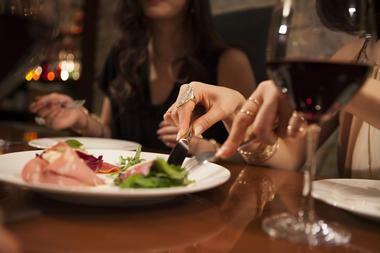 Though first impressions may be dim when visitors catch sight of the checkered tablecloths and plastic cutlery, let it be known that locals and visitors seek out, and constantly return to, this restaurant. Visitors love the famed dishes such as the chicken biryani, mutton peshawari, soft naan, or one of the many mouthwatering vegetarian dishes. There’s so much on offer at the restaurant that even the pickiest diner will find something they enjoy. 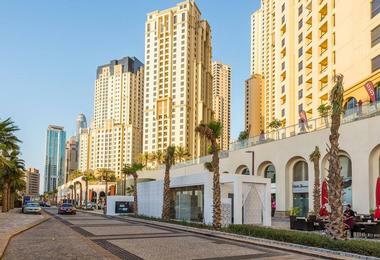 JBR Beach, also known as Jumeirah Beach Residence, is one of the most favored and most popular beaches in all of Dubai. There are so many outdoor activities here, including beach volleyball, jogging on the track, or cycling on the beach. Adventurous visitors can try water sports such as jet skiing or snorkeling, and there are many sport shops on site to rent lounges, boogie boards, and other equipment. With facilities such as changing rooms, showers, and toilets, it’s the number one beach choice for visitors with young children as it makes it easier for them to spend the day there enjoying themselves. Visitor of all ages will love The Walk promenade, which runs along the entire length of the beach. The promenade is filled with beachside restaurants, cafes, juice bars, bars, boutique shops, and souvenir shops.